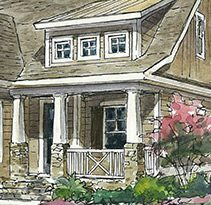 “The Bristol” – New Model Home Under Construction In Carolina Forest! This lovely cottage style home incorporates many current living trends of the modern family: large casual living spaces with view of the kitchen, focusing the family/kitchen/master suite around a luxurious outdoor living space for entertaining and enjoying the year-long summer weather, magnificent master suite with huge walk-in closets, walk-in master shower, elegant coffered and tray ceilings, upstairs flex space for the kids and grandkids, large garage and porches. We have a series of plans for the Waterbridge Community, as well as plans for other communities in Carolina Forest. Contact us for more details and study sets of plans. Please become a fan of “Carrell Homes and Carrell Commercial Construction” on Facebook. Over the coming months, we will be offering substantial discounts and specials through direct messaging on Facebook! We are constantly updating our Facebook page with pictures of current projects and new information. Just “Like” our page and let us know that you want to know about discounts when they are offered.